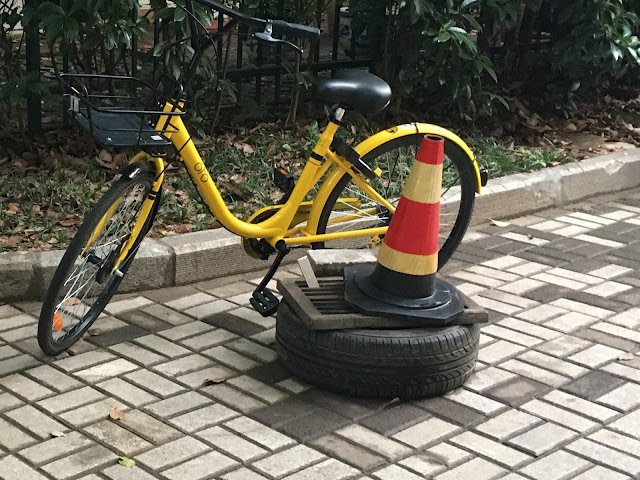 Some residents in Nanjing got together recently to deal with another challenge of shared-bikes in the city. Whether or not the bikes should be banned from residential compounds. Last Friday, the Yuhuatai District Yuhua Street Flower Temple Community [雨花台区雨花街道花神庙小区] convened a special meeting to hear residents’ concerns about the use of shared-bikes in their specific compound. This gathering is another step in city authorities’ ongoing efforts to try to manage the shared-bike phenomenon in Nanjing. Like other meetings here, this was democracy with Chinese characteristics. Three residents from the community were chosen to represent different views within the compound. One view was that shared-bikes had to be left outside the compound, possibly in already allocated areas on public avenues nearby. Another option aired was to seek specific spaces outside for bikes that could be used by residents, instead of simply leaving transport outside on the streets as others already do. That would rid residents of the temptation to park a bike in the compound to access more easily. Another representative argued that there should be rules and regulations for those bringing shared-bikes into the community, with residents organizing patrols “to strengthen publicity and patrol management, encouraging the civilized use of shared bicycles.” [加强宣传和巡逻管理，文明使用共享单车] That proposal included the community having its own shared-bike spaces within the compound, though bicycles parked there wouldn’t necessarily be returned there, so as to make sure “to prevent sharing from becoming exclusive” [防止共享变“独享”]--a sign that local socialism is surely not on its last wheels. All agreed that with over 200 or so shared-bikes being parked overnight in the community, there was a need to reach clarification on the role that the property management office should play—something that the local Party representative said was becoming a more important issue where shared-bikes were concerned. Property management companies in Nanjing are perhaps better than in some other cities and counties, but the track record of many is uneven at best. As is always the case here in China (especially in Nanjing, where every resident seems to either work or have worked in the local government, or knows someone who is or has), there were officials present for “face-to-face exchanges” [面对面交流]. During this session, representatives from the District Urban Management Bureau, Housing Bureau “and other functional departments and street leaders” [职能部门和街道领导] also attended to share views of the local government. Like residents themselves, local officials are scrambling to find solutions. Indeed, the account acknowledged that Nanjing government “has not yet introduced a clear approach to managing” the problem. The article also noted that, for their part, “residents in the end did not form a unified opinion, but they had enhanced understanding and tolerance” of the situation [但彼此间却增进了理解和包容]. For now, residents agreed to have the property management company take a more active role in addressing the issue. It may not be the ultimate solution or the best way to go forward, but it’s a further sign of just how start-and-stop policies are these days as the wheels here keep turning.